From the Field: How A Simple Revelation Makes the Experience. I grew up in a household where I was very encouraged to follow whatever path I desired. With just the right amount of parental guidance, I had the freedom to choose activities I wanted whether it was ballet, getting a summer job lifeguarding, or going to college in Atlanta, my parents were always supportive. It did not occurred to me, in those 22 years, that I was in an extremely privileged minority of young women in the world that are able to explore our own interests and determine the type of person we want to become. I never really thought of myself as a feminist, and in fact knew so little about these movements and the issues women face around the world that I thought the term ‘feminist’ was limited to women that burn their bra’s and complain about men. What I did learn was all about business strategy through my business school classes at Goizueta Business School at Emory University, and the second I heard about Social Enterprise I knew it was for me. Gray Matters Capital was right in Atlanta, so I interned with them, and after graduation joined their IDEX Fellowship program to learn first hand about affordable education initiatives in India. Going “back to school” was a little strange at first – I had just finally finished my 18 years of schooling from pre-primary through college, and now I found myself assigned to a very low-income private school in the outskirts of the Muslim old city in Hyderabad, India, with over 600 students, 16 almost all female staff, along with Ms. Lohia, the school correspondent/head mistress. 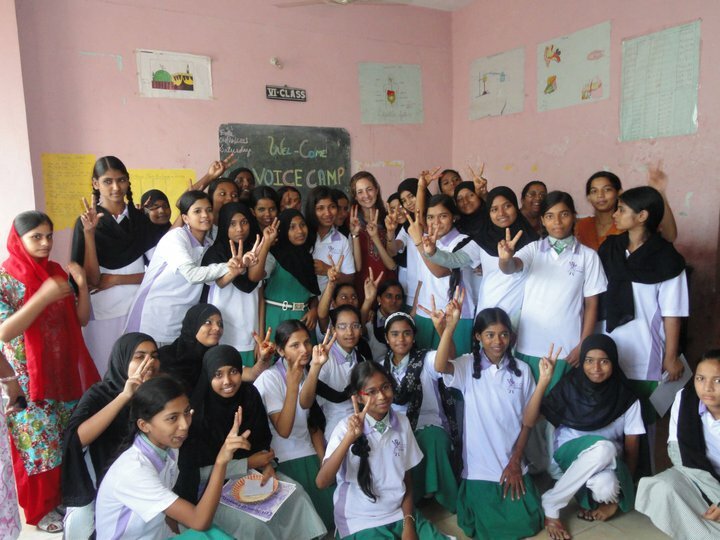 While creating a career counseling initiative and quickly realized that the girls were being pulled out of school or just completing 10th standard (equivalent of 10th grade in US), and getting married off, destined to live in their in-laws house, cooking and cleaning, and barely venturing outside of their own insulated communities. The girls were often thriving in school and each had dreams of being a doctor or engineer, though when I spoke to them about the schooling required for these jobs, they each said their parents wouldn’t approve. Talking to the teachers and other young women the reality sets in even more – many of them wanted more for their lives, but they are dependent on their parents and then their husbands once they get married for income and have children that they have to take care of. The statistics show that a large majority is dealing with physical, sexual, and verbal harassment within their households or communities even from very young ages. Whenever I was in schools talking to girls I had flashbacks to my own high school and college opportunities, where the sky was the limit. However, in India girls are not taught to think about their own wants, but rather look to others to make decisions for them. For the first time I felt strongly about a cause I wanted to fight for. I believed that every girl, regardless of birth locality, deserved the same ownership of life. I did see some bright lights, and mine was Ms. Lohia – a strong, Muslim woman, rooted in her religion but progressive in the way she operates her school and her life. She became a mentor to me on this path of understanding my role as an advocate for girls, showing me what is cultural and what are the parts that can change. Being able to start Voice 4 Girls has had a massive impact on my life. I don’t think of myself necessarily as an advocate for girls, but hope that through the organization that we’ve started, we’re giving more and more girls the tools to advocate for themselves. I was lucky enough to be born in a post civil rights era where I didn’t have to stand loudly and scream for my rights as a woman to go to higher education and have equal employment to men, but doing this type of work in India has given me the utmost appreciation for the women that did come before me and forged that path for me I hope that girls like Pravalika, Samreen, and Sana, who we have worked with will be part of the movement that forges this path for women in India, and I feel truly privileged to be a part of it. What events in your journey have led you to fight for a cause or initiative you feel strongly about? Hope your holidays have been wonderful! The VOICE Team is still up and running and ready for the next grant cycle. Thanks to 5 for Fairness we have the opportunity to utilize this platform to not only try to win the $5,000 grant but to also spread awareness for our cause. The grant cycle officially beings on February 1st and will end on the 22nd. Mark your calendars folks! Preparation for camp at a little over a 100 schools is underway and we need every ounce of support we can find. Your support, your likes, and especially your votes are so strongly appreciated. If you were a member last time you don’t even need to donate again to vote! Just log-in and cast your vote when the time comes. Thank you again for being a part of the Camp VOICE team!